From simple straight flights to double winder designs, our wooden stairs are computer designed and CNC machined for accuracy. Contemporary and modern, often with glass balustrading and simple lines. Traditional with turned mouldings and open or closed risers. 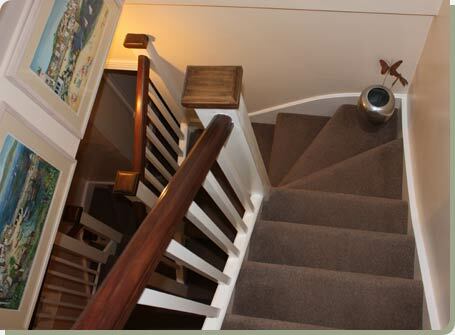 All timber stairs - internal and external stairways - can be manufactered in a variety of timbers and fitted by experienced carpenters. External stairways with matching handrail and balustrading to your raised sun deck or balcony - whatever your needs everything is made bespoke to your requirements.